The "airline with a heart" is known for giving passengers heart-shaped chocolates upon disembarkation. Before departing from Munich Air Berlin said a farewell to its passengers and employees. "Air Berlin said thanks on this sad day to all the staff, partners and passengers who passed us who have given their hearts and their loyalty for many years,” the company said in a statement. Originally registered as Air Berlin USA, the company was founded in 1978 as a wholly owned subsidiary of Lelco, an American agricultural enterprise headquartered in Oregon, to operate charter flights on behalf of German tour operators from Berlin Tegel Airport. As part of the deal, Lufthansa will take over Air Berlin's low-cost leisure airline Niki and its LG Walter regional airline. The sale still needs approval from creditors and European Union anti-trust authorities to take effect. Today, Saturday 28th October, Easyjet said it would buy part of Air Berlin's operations at Tegel airport. The low-cost British carrier will lease up to 25 A320 aircraft and a buy Air Berlin's take-off and landing rights at Tegel. The deal was valued at €40 million. It also said up to 1,000 Air Berlin employees could be recruited. The Emirates story starts back in 1985 when they launched operations with just two aircraft, an Airbus A300 B4 and a Boeing 737. This was due to Gulf Air cutting back its services to Dubai. As a result, Emirates was conceived in March 1985 with backing from Dubai's royal family, with Pakistan International Airlines providing two of the airline's first aircraft on wet-lease. The Royal Family's Dubai Royal Air Wing also provided the airline with two used Boeing 727–200 Adv as a gift. The airline was founded on the 25th March 1985 and commenced operations later that year on the 25th October 1985. On that day flight EK600 departed Dubai International for Karachi. Emirates is based in Dubai, United Arab Emirates. The airline is a subsidiary of The Emirates Group, which is wholly owned by the government of Dubai's Investment Corporation of Dubai. It is the largest airline in the Middle East with a fleet of 238 aircraft, operating over 3,600 flights per week from its hub at Dubai International Airport. Emirates flies to more than 154 cities in 81 countries across six continents. Emirates is the world's fourth largest airline by scheduled revenue passenger-kilometers flown, the fourth-largest in terms of international passengers carried, and the second-largest in terms of freight tonne kilometers flown. Emirates operates a mixed fleet of Airbus A380's and Boeing aircraft and is one of the few airlines to operate an all-wide-body aircraft fleet. As of September 2017, Emirates was the largest Airbus A380 operator with 100 planes in service (taking delivery of it's 100th A380 on the 12 September 2017) and a further 42 in orders. Since their introduction, the Airbus A380 has become an integral part of Emirates fleet, especially on long-haul high-traffic routes. Emirates is also the world's largest Boeing 777 operator with over 130 planes in service. Emirates had the longest non-stop commercial flight from Dubai to Auckland until it was surpassed by Qatar Airways flying from Doha to Auckland. Well after 7 days in Adelaide, two days plane spotting the other 5 attending a conference, it was time to head home to Brisbane to see my amazing understanding family. Our Qantas flight wasn't until 2.05pm and boarding was to be at 1.45pm. With my director and his wife in tow, our purchasing officer and a few other people that attended the conference, we arrived at the airport around 11.30am and we headed to the Qantas Club for some lunch and some relaxation before the flight. At 1pm I went out to see what movements there were for the last time before my flight. It was great to see the Virgin Australia A320 as this is a rare sighting, we don't get Virgin A320's on the East Coast of Australia. We began boarding at 1.40pm (local time) through gate 18 and I took my seat which was 25F. The aircraft for today was VH-VYB (CN 33763) I have been on VYB four times so far. 16/2/15; 19/12/16; 13/9/17 and today. The last cabin door was closed at 1.57pm and we pushed back at 2.01pm. Pushing back it was great to see another rare site and that was Virgin Fokker F28 MK100 next to the A320. At 2.05 we began taxiing and as runway 23 was in use we had a very short taxi out so we had to hold until the cabin crew finished the safety drill. We lined up and got airborne 2.11 taking off over the Glenelg Beach were we I stayed for the last week. We banked left and set track for Renmark in South Australia. As we climbed to 370 we maintained that heading for an hour and a half flying over Stanthorpe and Warwick. The flying time for today's flight was 2 hours 4 minutes. We began our descent into Brisbane at 3.53pm and landed on runway 01 in Brisbane at 4.20pm. Well yesterday was the last day of the conference, there were still lots of suppliers to go through, then a member forum and brain storming session. At lunch time we took the annual group member photo, this a little difficult to organise this time around due to where we were and time restraints. The conference came to an end and we had just over an hour and a half to get ready for the Gala Dinner and show, but the real pressure was on the hotel staff to transform the room from a meeting room to the Gala dinner room, because the Gala Dinner was being held in the same ballroom where we had the conference. 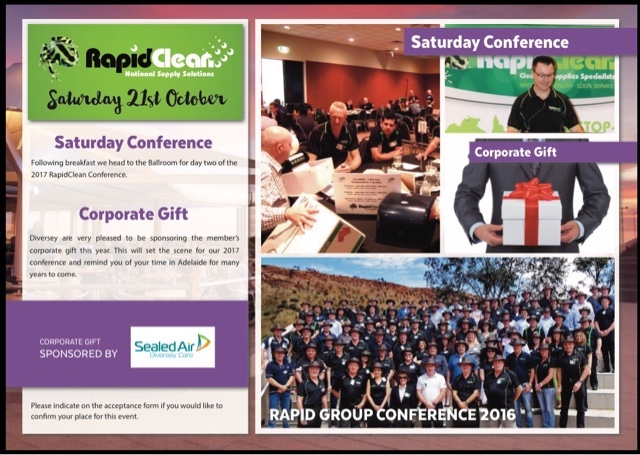 The awards are handed out from the manufactures to the Rapid members and where Rapid committee hand out awards to its members as well. 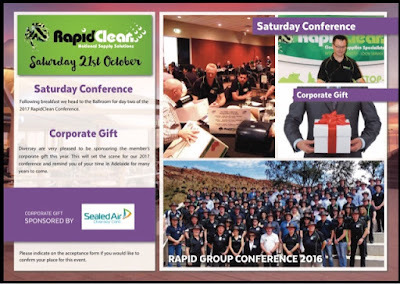 I am really excited to say our company won 7 awards all up (6 for Brisbane and 1 for Sydney) included in the 7 was 2nd place for Member of the Year. We have won this award for 2 years in a row now. After the formalities it was time to party and the night got kicked off by some Brazilian musicians followed by Brazilian dancers. Around 11.30pm we were kicked out of the ballroom so we went out into the mall area outside the hotel and found a great pub called the Jetty Hotel. Well, we were singing our hearts out and drinking like there was no tomorrow. Then at 2am, due to liquor laws, the pub had to close. I have had an amazing week, from plane spotting Monday and Tuesday to sight seeing Thursday and winning awards last night. Really looking forward to going home to my amazing family. Well after a fun day yesterday it was time to get serious and get down to business but not before I rang my wife in Brisbane to wish her a Happy 16th Wedding Anniversary. After the AGM was done and dusted for another year, we got down to meeting the suppliers. They get 18 minutes to impress us with their new products or specials, then we move on to the next table and so on. We broke for morning tea then got back into it again going through until 12.30 were we stopped for lunch. When we returned we had a guest speaker in the way of Greg Cooper; the great grandson of the founder of Coopers Beer. His story was very fascinating and had the audience captivated and wanting more. After the speech was done it was back into it until 3.20. 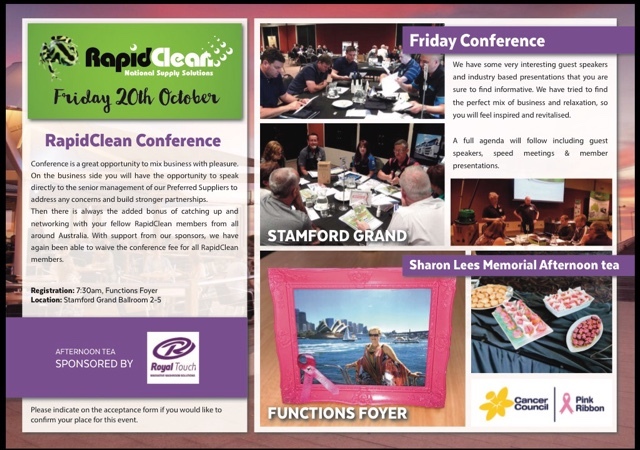 There we stopped for the day having afternoon tea but to also remember and pay respects to the late Sharon Lee, the wife of Rapid Clean's General Manager, who passed away with cancer last year. 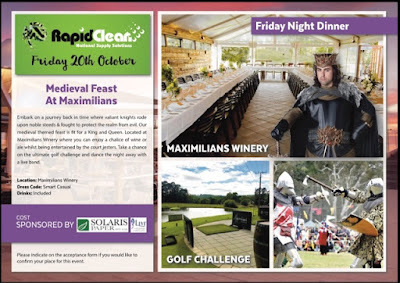 There were pink items to eat plus Cancer Council products for sale as they did a fund raiser. After that it was time to head up to the room and refresh before we jumped on the bus for another night out, this time we were heading for a Medieval Feast at Maximillian's Winery. After being handed a drink on arrival we were offered the chance to wine some wine by hitting a golf ball into the middle of a pond and landing the ball on the green. I had a go but not ever played golf before, I could have thrown the ball further than I hit it. We also had another chance to do some wine tasting. Then it was time to sit down and eat and can I say the food was absolutely sensational, moist and tender. After the amazing dinner the band started people got up to danced the night away. It was another wonderful evening had by all.